OLYMPIA – Washington voters will get to vote on a gun control initiative this November after all. The Washington Supreme Court on Friday reversed a lower court’s decision blocking Initiative 1639 from the November ballot, ruling that Secretary of State Kim Wyman does not have the legal authority to reject it. Gun rights advocates, including Robin Ball of Spokane’s Sharp Shooting Indoor Range and Gun Shop, challenged the validity of the petitions, contending the type on the back that spells out the entire initiative was too small to read and the changes to state law were not clearly marked with the standard process of striking out words that would be removed and underlining words that would be added. Wyman acknowledged those problems after I-1639 supporters submitted some 378,000 signatures, but said she had no legal authority to reject them. A check of signatures later revealed the petitions had more than enough to qualify for the November ballot. Ball, Alan Gottlieb of the Second Amendment Foundation, and others then used that as a basis to seek a court order preventing the initiative from going before voters. Last week, Thurston County Superior Court Judge James Dixon agreed with gun-rights advocates that the size of the print was too small and the proposed changes not clearly marked. “I have 20-20 vision. I can’t read it,” Dixon said in granting a writ of mandamus to keep Wyman from putting I-1639 off the ballot. The issue is not whether one agrees with the goals of the initiative, he said, but whether the petition voters signed provides a true, accurate and readable version of the law as it would be changed. 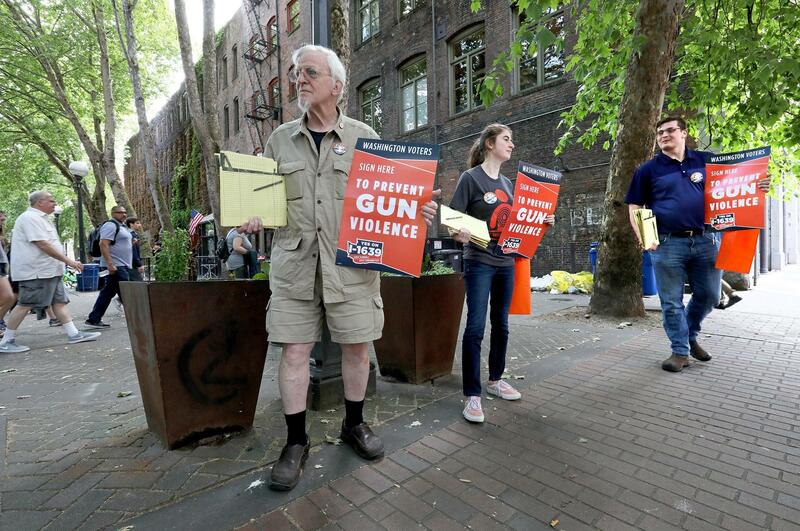 Attorneys for gun-rights advocates had contended allowing I-1639 to go on the ballot with those flaws would result in “open season” for unreadable text in future ballot measures. “If this passes muster, what’s next?” attorney Eric Lindberg asked Dixon. Greg Wong, an attorney for Safe Schools Safe Communities argued that the ballot title and initiative description on the front of the petitions were correct and signers clearly understood what the proposal would do. “There’s not a single piece of evidence that voters did not understand the law they signed,” Wong said. But sponsors quickly filed an appeal, and after a speedy round of briefs from both sides this week, the Supreme Court ruled Dixon was wrong. State law governing the acceptance of initiative petitions is narrow, Chief Justice Mary Fairhurst said. “It does not allow for pre-election review of the form, process, subtance or constitutionality of an initiative petition,” she wrote. Instead, it only allows a court to examine whether the petitions have the required number of signatures from voters. “There is no actual challenge to the county of signatures,” Fairhurst wrote. The Supreme Court rarely blocks an initiative with enough signatures from the ballot, preferring to review challenges if voters pass the measure. Opponents have said that if they are unsuccessful in keeping it off the ballot, they may use the problems with the wording on the back of petitions to challenge its validity if it passes. Published: Aug. 24, 2018, 5:15 p.m. Updated: Aug. 28, 2018, 10:56 a.m.